It was Friday afternoon. John was an easy-going middle-aged artist, leading a team of young artists. John always enjoyed Fridays because that's the day he handed out the paychecks. John cared about his employees. He let them work whenever they wanted to because they were pursing school and other careers. John took pride in preparing young people for a career in tech. The shop was full of life. Only today things didn't feel right. It never occurred to John that any of his employees would cheat the timekeeping system. He just assumed they were loyal. While walking through the shop handing out checks, he just happened to notice that one was unusually large. The check belonged to Elisabeth. She was an intelligent 22 year old working her way through college. John estimated her check in the $300 range. This check was nearly twice that amount. Elizabeth was everybody's favorite. She was the quiet, studious type. Of everyone working there, Elisabeth is the last person you think would cheat. John's heart sank as he looked at her check. His mind raced, looking for ways to justify the large paycheck. Maybe she worked late? Maybe this is two week's pay? But the truth was undeniable. Elisabeth and Bill carpooled. They came and left in the same car. Bill worked five days a week. Elizabeth worked three. Elizabeth's 3-day check was larger than Bill's 5-day check. There was no way around it. She was cheating. At that moment John's win-win team concept came crashing down. The thought of employees conspiring against the company sickened him. He was glad it was Friday because he didn't feel like working anymore. Dishonesty in the workplace was inconceivable. Trusted employees should not betray the company they work for. None of this made sense. He knew complaining about attendance wasn't right. He knew arguing with employees wasn't right either. Employees should uphold their end of the bargain. He needed to right this wrong. Being a programmer John knew computer logins could potentially fix this attendance problem. 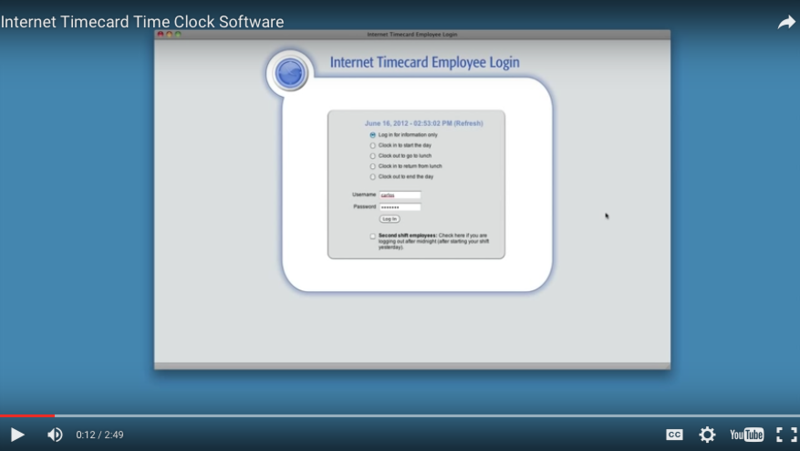 Having employees log into their computers before starting work was a socially acceptable way of marking time and location. That's when Internet Timecard was born. John programmed the system over the weekend. On Monday morning John said, "Hello Elisabeth. We have a timekeeping system now. Here is your username and password. Log in to start your day and log out to end your day." There was no arguing. This simple change took control away from employees and gave it back to the company. Internet Timecard worked. There was a detailed timekeeping system in place where formally there was none. Elisabeth changed immediatlely. She knew cheating was no longer an option. She understood that if you need more pay work more hours. 1. Employees cannot fudge their hours when you have detailed timekeeping system in place. 2. A boss does not need to be adversarial with employees to control attendance. Don't let attendance-related negative emotions disempower your workplace. 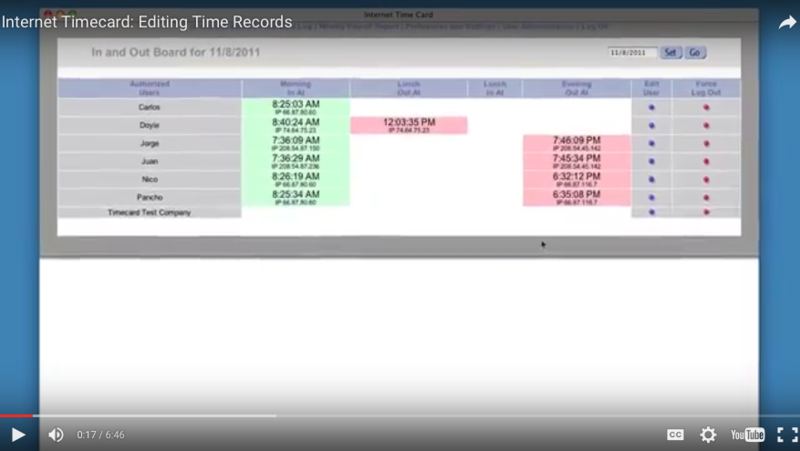 Internet Timecard will provide the honest structure you need. It will create the worry-free working environment you deserve. Managing Attendance At Medical Facilites For Over 10 Years! Give usernames and passwords to your employees. Tell them to mark their time. Employees control their attendance. 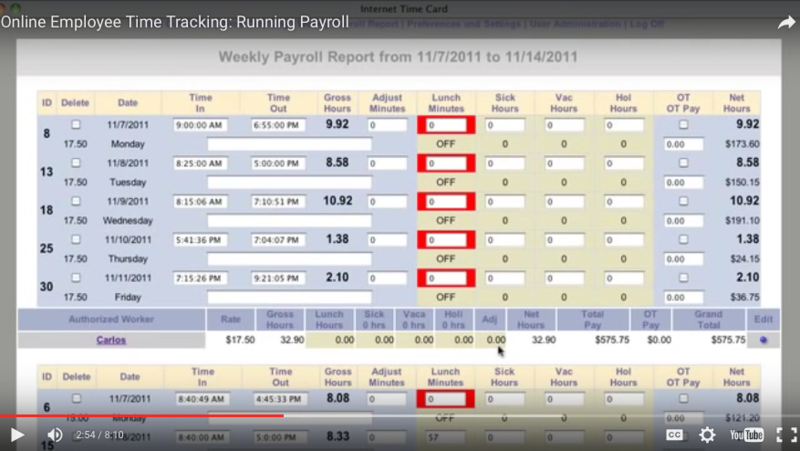 Take a minute to check the log before running payroll, manually fixing missing information. Attendance behavior is corrected. One click calculates payroll based on time worked to the penny. The system supports holiday pay, sick pay, vacation and overtime. "I must admit I was skeptical. I was amazed at how everyone's attendance fell in line immediately after implementing the system. Employees respect the record keeping aspect of the system." "I've been taken to the labor board twice by disgruntled employees. I won both times because of evidence - detailed timekeeping records showing exactly what hours were worked." "We run swimming classes. Our instructors were constantly misstating their hours. Internet Timecard got this down to only hours worked. I cannot run a profitable business without it."